♥ I Love Lucy DigiArt Designs ♥: 2013 Party with Tasha's Playground! 2013 Party with Tasha's Playground! Here is a tag I made with a very cool 2013 New Year PTU themed kit called 2013 Party, made by my friend Tasha. You can check out all the kits she has by visiting her blog HERE. I am using a Pics For Design exclusive tube by Eugene Rzhevskii. 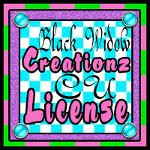 You will need a license to use any art purchased from www.picsfordesign.com and it must be displayed as well. I used 2 FTU masks by Angela that are within the Christmas/Winter pack by the Creative Misfits HERE. 1. Open up the tube of choice, scale the body to 493 x 627. Click the eye next to the close up to make it invisible for now, we will work on it soon. Delete any other layers. paper 1- using ellipse select tool, create an oval then SELECT>INVERT and EDIT>CLEAR. SELECT>NONE then right click on it in layers box, ALPHA TO SELECTION, SELECT>SHRINK by 7 and EDIT>CLEAR. paper 8- using the fuzzy select tool, make sure the paper 1 layer is still the activated layer in the layers box, then click within the middle of the frame you just made with it, go to SELECT>GROW by 3 then SELECT>INVERT and EDIT>CLEAR. This will make paper 8 fill the inside of the frame. paper 12- scale to 388 x 388 and duplicate, flip and align side by side, merge the two layers together, then using fuzzy select tool, click inside frame 2, hold down shift and click inside the second part of the frame and the third part. Go to SELECT>GROW by 2 then make sure the paper layer is activated, SELECT>INVERT and EDIT>CLEAR. Position all as shown. Add drop shadow to layers- confetti 2, sparkler, beads, paper 1, by going to FILTERS>LIGHT & SHADOW>DROP SHADOW with settings at 3/3/6. Then add a drop shadow with settings at 8/8/ 15 to layers- drink, clock, the tube of choice, lights and disco ball. 3. Let's make the mask for the background... Add both the masks from her folder, while the second one is activated in layers box go to COLORS>INVERT and LAYER>TRANSPARENCY>COLOR TO ALPHA. Then again COLORS>INVERT. Position it above the other mask and merge down. Repeat the above steps. Right click on the mask in layers box, ALPHA TO SELECTION, then activate paper 7 and SELECT>INVERT and EDIT> CLEAR. Paper 7 is now the mask so you can delete the original. 4. Click the eye next to the close up tube to make it visible, then in the layers box go to MODE and select ADDITION. This makes all the sparkly parts of the paper come thru. A cool effect :) Add the copyright to your tag, include artist's name, website and license number if applicable. 5. I used a font called Sacramento in white. I then duplicated the layer, went up to FILTERS>ALPHA TO LOGO>NEON with effect size 30, background black and glow color hot pink. Merge the tube layer and glow layer together and EDIT>COPY. EDIT> UNDO to before you chose the filter. EDIT>PASTE AS NEW LAYER. Align behind text. Then right click on the white text, ALPHA TO SELECTION then SELECT>SHRINK by 1, add a new layer and fill with black.